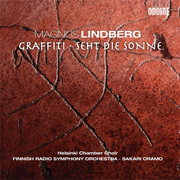 Graffiti (2009) by Magnus Lindberg has been nominated for a GRAMMY Award in the category of Best Classical Contemporary Composition. The winners of the 53rd GRAMMY Awards will be announced in a ceremony held by the National Academy of Recording Arts & Sciences on February 13, 2011. For his first large-scale choral composition with orchestra written in 2009, Magnus Lindberg used a selection of 2000-year-old Latin graffiti inscriptions from the walls of excavated Pompeii houses. The work earned Magnus Lindberg a 2009 Finnish Composer Society's Award. The GRAMMY nominated world première recording was released by Ondine in Spring 2010 to great international acclaim, including a recent nomination for the 2011 International Classical Music Awards. The recording features the Helsinki Chamber Choir and the Finnish Radio Symphony Orchestra under the direction of Sakari Oramo (ODE 1157-2). Magnus Lindberg is one of the internationally best known Finnish composers of today and currently serves as Composer-in-Residence with the New York Philharmonic. Click here for more information on the nominated CD. For more information on the 2010 GRAMMY Nominees, visit the website of the 53rd Annual GRAMMY Awards.